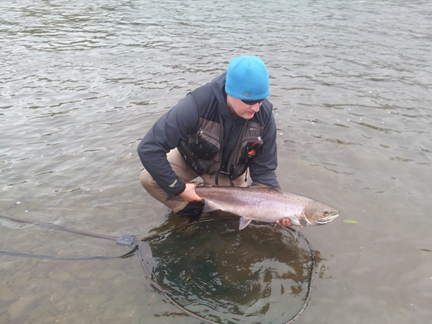 Over the four days, I took 11 fish to the fly. 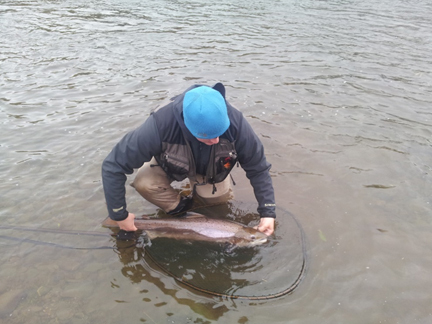 All fished were safely released to continue their migrations. Below is a series of pictures of some good catch and release practice, the fish was only out of water for a matter of seconds! 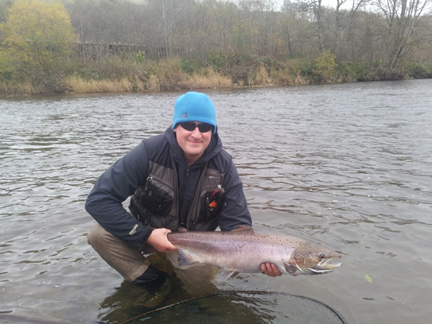 This was one of 8 fish for the day from the Boleside beat, River Tweed. These included two 15’s a 14lb, 12lb, 2 x10lb, and two around the 8/9lb mark. 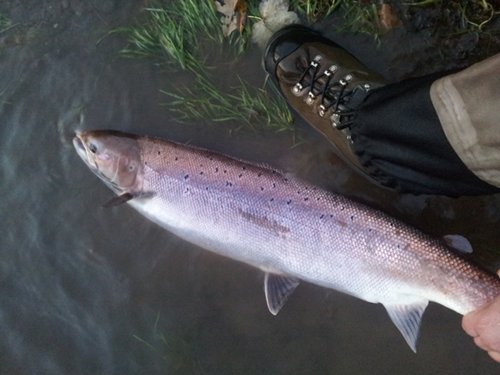 All fish were taken on a three inch brass Willie Gunn. Getting Deep! 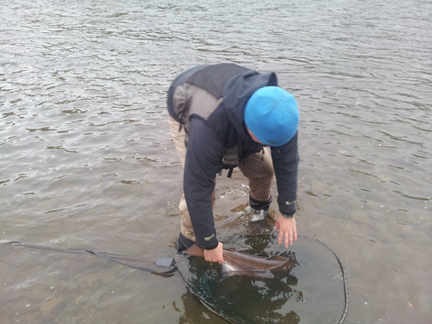 The Boleside is a heavily fished beat with 5 rods for 5 days a week throughout the season. Yes there are a lot of fish, the water was boiling when we were there, however people can struggle to catch. 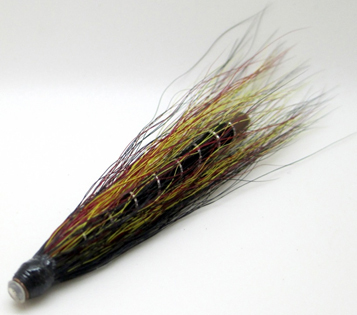 In the morning I had taken the Ghillies advice regards flies: Small black and red tubes fished on a fast sink tip. However I felt my fly wasn’t getting in amongst the fish, end of day one I switch to the 3 inch brass willie gunn, a big fly and difficult to cast, yet produced a fish almost instantly. Day 2 I was prepared and went straight to the Willie Gunn, fish instantly and all day long, numerous dropped fish plus the 8 to the bank. It goes to show, stick with your gut feeling and do something different. At the end of the day people could not belive what I had been fishing with, yet they had stuck with the same fly and only caught a fish each! 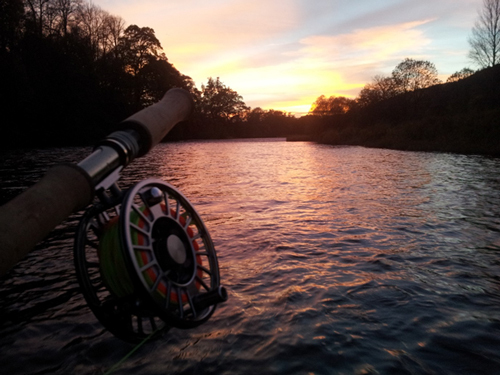 The weather at this time of year leaves for some stunning scenery with the temperature dropping and trees turning golden, on the final evening we were treated to a stunning sunset over the river of vivid red. 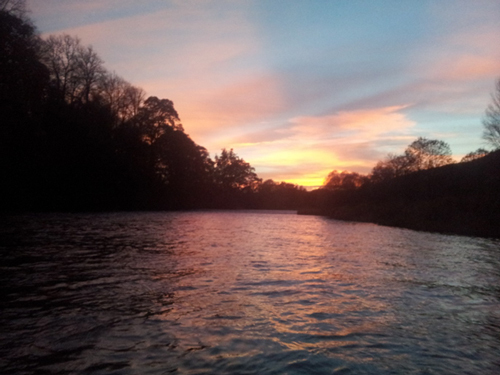 Apologies for the quality, It was taken mid river with a camera phone, through a pair of polarising sunglasses!